Congratulations to everyone who ran! This was our biggest turnout ever, 63% more than the previous record! 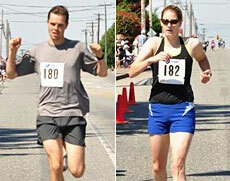 Overall male and female winners were: Ben Thistlewood (4:29) and Anna Hilborn (5:42). Shaunna Asselstine, Norma Clark, Jacquie Sabourin, Patricia Swadden, Laura Smail and everyone who pitched in to help.